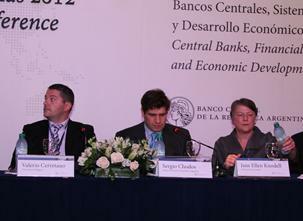 Let me briefly comment on two additional and interrelated presentations at the Central Bank of Argentina's annual conference. Two of the presentations were important in dispelling the myth that central banks were historically only concerned with inflation, and not particularly relevant for economic growth. Jane Knodell presented a paper on the evolution of the US banking sector from the late 18th century up to the Civil War, including the First and Second Banks of the United States, which were in many ways like the Bank of England a quasi-central bank. Jane's presentation very clearly shows that the main role of the First Bank of the United States was as a fiscal agent of the federal government, its liabilities used to collect revenue and meet federal payment obligations, including debt service, a similar role to the Second Bank. More importantly, she concludes that the closing of the Second Bank by Andrew Jackson had a positive effect on growth, since the evidence suggests that countries with central banks concerned with the Gold Standard, as they tended to be in the 19th century, grew less than the US. Valerio Cerretano's presentation was on the little known, at least among economists, industrial intervention by the Bank of England and the Bank of Italy in the inter-war period. Both central banks became directly involved in the 1920s and 30s in the administration of industrial firms, through direct management or through participation in holding companies. In the case of Britain the Bank of England was essential for assisting reconstruction of traditional sectors (heavy industries and cotton) and development of innovative industries (man-made fibres, aluminium), some of which were crucial latter in the war effort. In other words, central banks have been directly involved in the funding of the Treasury and the industrial sector in developed countries, but it seems that, as Ha-Joon Chang has suggested for the case of international trade, once they got up the ladder using their banks to promote development they kicked it, and argued that they should only promote price stability.